When I visited Bart Peters last week, to talk about Benny Vreden, who started the company BVP that Bart and his wife Edith are now running, he asked me what musical our class did in the sixth class of primary school. Bart didn’t know that I have already written about this musical in this blog. I thought that the name of the musical was ”De tijdmachine” , so that is what I said to him. But it turns out that the musical is called ”De wonderlijke machine van Professor Knap” . It is written by Hans Peters, Bart’s father. Our school must have had the original LP, but I have no memories of ever seeing that LP. Nor did I ever see a copy later. But I went home that morning with a CD of the musical and a booklet with all the texts. When I listened to the CD later that day, and read all the lyrics and the stage directions, I had a head full of memories that the sounds dug up from very deep. I didn’t play a role of any importance in the musical and I cannot remember very much of it. But our schoolteacher asked all the children to draw an invitation, that would be given to our parents. I remember my drawing very well. And if I have the time one of these days, I will try to reproduce it. Our school teacher used other records that were published by BVP too. I remember especially the song ”De Toeteraar” by Connie Vink. The reason I remember this is that I saw Connie Vink on television one day and could not grasp the link between the women on TV and the singer of the record. I knew that they were the same, but how a women that sung a song on a record that was played in our class could be on television, was a complete mystery to me. I mean, television came from another planet than the place where I lived. What you heard above, is the openings sound effect of the musical ”De wonderlijke machine van Professor Knap” . When I did a Google search, I noticed that several people are looking for this LP and other early BVP-musicals. But you can order all of the musicals on their site. Here is the song that I remembered best. 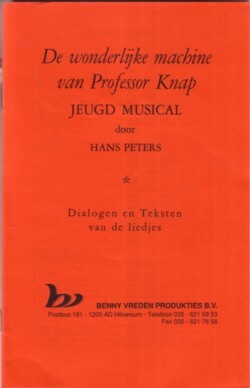 For a retiring teacher (who performed this musical in his starting year) we are looking for a (digital) copy of this book (de wonderlijke tijdmachine). If you still have it, or know where to get it, you would do us (primary school in The Netherlands) a huge favor! Hallo Eric, Dit is het bedrijf dat de musical heeft gemaakt: https://www.bennyvreden.nl/contact/ Groeten!